The party's total is up 16,000, compared with 4,000 added to Republican ranks, as Maine registrations break a record with nearly three weeks still to go before the election. Voter registration is at an all-time high in Maine, with Democrats gaining most of the ground at the expense of Republicans and unenrolled voters, according to data from the Secretary of State’s Office. 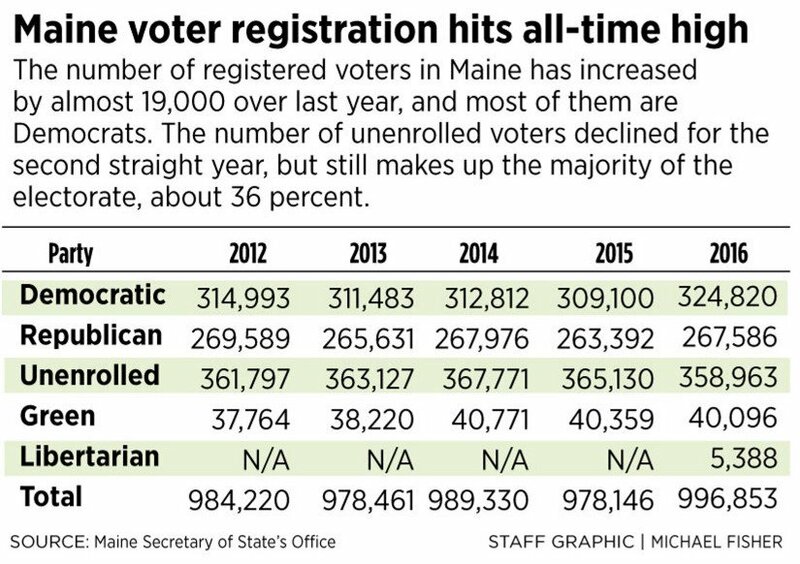 Unenrolled voters still make up the biggest bloc in Maine, about 36 percent, but Democrats have registered more than three times as many additional voters as Republicans since this time last year. According to data released Thursday, the number of registered Democrats has jumped by nearly 16,000, from 309,100 last year to 324,820 so far in 2016. Republican ranks increased by more than 4,000, from 263,392 in 2015 to 267,586 this year. The number of unenrolled voters has decreased by about 6,000, from 365,130 last year to 358,963 today. The total number of registered voters – 996,853 – is almost 19,000 more than last year and the highest on record in Maine. That number will only keep rising because registration is allowed up to and including Election Day. The new data mirrors trends across the country before the 2016 election. Several states have broken voter registration records already, including Oregon, Washington and Texas. It’s not clear how many new voters registered ahead of the March caucuses. Voters can only participate in caucuses if they register with a specific party. The registration numbers in Maine could be good news for Democrats, who also have a 2-to-1 margin in absentee voting in Maine thus far. In the 2nd Congressional District, 47 percent of absentee ballots have been submitted by Democrats, compared with 27 percent by Republicans, as of Monday. In the 1st District, Democrats accounted for 51 percent of absentee ballots, compared with 22 percent for Republicans, according to the Associated Press. Even so, Gov. Paul LePage, a Republican, has won two statewide elections, and U.S. Sen. Susan Collins, also a Republican, won re-election two years ago with 68 percent of the vote. The towns that saw the biggest gains in registration – more than 5 percent – included Newcastle, Kittery, Brunswick, Sebago, Farmington, Kennebunkport, South Berwick, Naples, Camden and Cumberland. In most of these towns, Democratic registrations far exceeded Republican ones, except for Naples, which has signed up 42 new Republicans and 32 new Democrats. The towns that have lost the most registered voters since last year were Caribou, Orono, Minot, Guilford and Auburn. Not all registered voters will cast ballots next month, but Maine historically has seen high turnout, especially in presidential years. In 2012, when President Obama won re-election, 71 percent of registered voters turned out, which ranked Maine behind only Minnesota and Wisconsin, two Rust Belt battleground states. Secretary of State Matthew Dunlap has said he expects high turnout this year, driven by a contentious presidential election between Democrat Hillary Clinton and Republican Donald Trump, and a handful of high-profile statewide referendum questions ranging from legalizing marijuana to requiring background checks on gun purchases to raising the minimum wage. Comparing this year’s numbers with 2012, there are about 10,000 more registered Democrats, who now make up 32.6 percent of voters, and about 2,000 fewer Republicans, who account for 26.8 percent. The Maine Green Independent Party has gained about 2,500 registered voters in the past four years and stands at 40,096, about 4 percent. And for the first time, Libertarians are an established political party in 2016. So far, 5,388 have checked that box, about 0.5 percent of all registered voters, according to the secretary of state.